Should we raise the national debt limit to accommodate more trillion-dollar deficits? In Washington, it’s taken for granted that we should and will. But a lot of fiscal conservatives have got the crazy idea in their heads that any debt increase should be accompanied by something we haven’t seen in years: a budget. An actual plan to balance the budget and stop accumulating debt. President Obama is having none of it. Yesterday morning, he conducted a press conference clearly intended to put fiscal conservatives on the defensive in the next round of the Great Debt Ceiling Debate. His various claims and assertions, taken together, are so misleading, that only a line-by-line rebuttal can do them justice. Response: Correct. On August 2, 2011, President Obama signed into law a $2,100,000,000,000 ($2.1 trillion) increase in the government’s statutory debt limit. Roughly 518 days later, the money ran out and Treasury hit the $16,394,000,000,000 [$16.394 trillion] ceiling on its borrowing authority. Because of massive overspending, America is on an unsustainable fiscal path. The government technically came up to its current statutory borrowing limit — of some $16,400,000,000,000 [$16.4 trillion] — at the end of December. The Treasury, however, has the ability to do a bit of juggling with certain government funds and so keep us under the ceiling for a couple of months. Uncle Sam is currently spending about $100,000,000,000 [$100 billion] a month more than he takes in. Treasury’s “extraordinary measures” to avoid hitting the ceiling are said to buy about $200,000,000,000 [$200 billion] worth — or two months — of headroom. Experts predict we will run out of headroom sometime in the latter half of February. At that point, the government won’t be able to continue borrowing. Since the government currently raises only about 60 percent of the funds it needs to cover its expenses, this will mean an immediate 40 percent reduction in federal outlays (or more precisely, a postponement of 40 percent of federal outlays, as prioritized by the president). The remedy for this cash-flow crunch will come when Congress either raises the debt limit, increases taxes, or reduces spending, or some combination. … [the debt ceiling is] something most Americans hadn’t even heard of before two years ago. Response: True. Most Americans had never heard of the debt limit before two years ago. That’s because, prior to the historic wave of “tea party” freshmen elected to Congress in 2010, Washington always simply raised the debt ceiling without much debate, and never coupled it with serious spending reforms. Beginning in 2011, Republicans began trying to use the debt ceiling as leverage to force Uncle Sam to start getting his terrible overspending habit under control. This move was not entirely unprecedented; the debt ceiling had in fact often been paired with spending or budget-related bills in the past. But it was a historic change, to the extent that Republicans were now discussing much larger savings amounts than had ever been contemplated in the past. It was a seachange — and one deeply resented by Mr. Obama and much of official Washington. By the way, we are incurring debt at the rate of nearly $47,000 every second, $100,000,000,000 ($100 billion) every month, $1,200,000,000,000 ($1.2 trillion) every year. We and our posterity will have to pay that debt back, one way or another: either through higher taxes, higher prices (i.e., inflation and interest rates), or else less government spending than currently promised. The latter path is best. But no matter how we pay it back, excessive government debt means slower economic growth and a lower standard of living for everyone. Since 2001, the debt limit has been raised 13 times for a total of $10,400,000,000,000 ($10.4 trillion). About half that total — $5,000,000,000,000 ($5 trillion) — was added during President George W. Bush’s eight years in office. The other half, during President Obama’s first four years in office. Not counting the tens of trillions in unfunded future promises, every man, woman, and child in America is responsible for $52,000 in government debt. So I want to be clear about this: The debt ceiling is not a question of authorizing more spending. Raising the debt ceiling does not authorize more spending. It simply allows the country to pay for spending that Congress has already committed to. These are bills that have already been racked up, and we need to pay them. Response: This is correct. The debt ceiling does not authorize more spending. What it authorizes is more borrowing. And the government does need to pay its bills. But the reason the next debt ceiling hike needs to be coupled with spending reforms is that Washington, as we’ve noted, has a bad overspending habit. Why would we increase Uncle Sam’s credit line again without putting in place a plan to help him get his overspending habit under control? 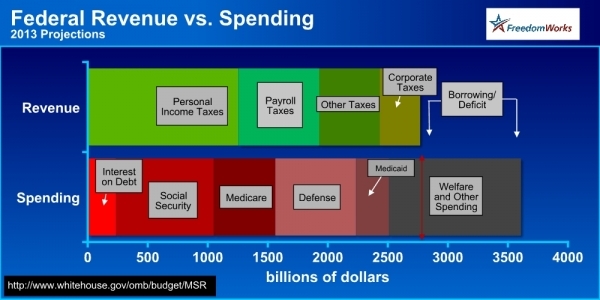 As the chart above shows, if we hit the debt ceiling, we will still have more than enough tax revenue coming in to pay the most economically and politically sensitive obligations. Response: False. In talking about “not paying our bills,” Mr. Obama is hinting — without openly saying — that the US Government might fail to pay its creditors. This is highly irresponsible. He knows very well that, in the event we hit the debt ceiling, the US will continue to be able to pay all holders of US bonds (principal as well as interest). Even so deep-dyed a left-winger as Mr. Obama would never dare to miss a payment to bondholders. If he did, Uncle Sam’s credit rating would almost certainly take an immediate hit, driving up interest rates and rattling world markets. In failing to make all this clear, the President allows those who are less knowledgeable to mistakenly assume that a debt default is a realistic possibility. It’s not. There will be no default. Rather than a “default” crisis, hitting the debt ceiling would mean a payments crisis, a sizable cash-flow crunch. That’s much less worrisome, economically speaking. To be sure, it would not be a good thing. But neither would it be the end of the world. Response: So far, Mr. Obama’s definition of “compromise” on deficit reduction has been to insist on tax increases and to resist actual spending reductions. … America cannot afford another debate with this Congress about whether or not they should pay the bills they’ve already racked up. Response: That is not the debate fiscal conservatives are asking for. Fiscal conservatives are asking for a debate about how to stop racking up even more bills in the future. And the debt ceiling bill is the only leverage they have to force this debate. And by the way, as the Washington Examiner’s Conn Carroll has pointed out, “Demanding a price for a debt limit hike vote is absolutely business as normal in Washington,” adding: “the debt limit is almost always raised in the context of some other deficit reduction/budget process legislation.” Mr. Obama’s position that he won’t even negotiate over a debt limit increase — that it must be presented to him “clean” — is historically extreme. Response: Mr. Obama is trying to make it sound like Republicans are excessively fixated on the national debt, which, at more than 100 percent of our annual GDP, has entered the economic danger zone (a la Greece). Many congressional Democrats also claim to care about excessive debt. Some of those Democrats are Senators from very Republican states facing potentially tough reelection battles in 2014 — Democrats like Max Baucus of Montana, Mark Begich of Alaska, Kay Hagan of North Carolina, Tim Johnson of South Dakota, Mary Landrieu of Louisiana, and Mark Pryor of Arkansas. These Democrats will almost certainly side with Republicans in wanting the next debt hike to be coupled with some form of spending restraint, even if it’s only a fig leaf — rather than the “clean” debt hike demanded by Mr. Obama. … Social Security checks, and veterans benefits will be delayed. Response: False. Even if we hit the debt ceiling, the government will still be taking in a huge amount of revenue, equivalent to 15 percent of GDP. The problem is the government is spending nearly 25 percent of GDP. So, suddently being unable to borrow, it won’t have enough money available to cover all its bills. The President will have to prioritize payments, paying some people now and promising to pay others later. But here’s the important part: The amount of revenue coming in will be more than enough to cover all monthly Social Security checks and veterans benefits. If Mr. Obama declines to mail those particular checks, that will be his choice, not Republicans’. We might not be able to pay our troops, or honor our contracts with small business owners. Response: This is misleading. There would be enough money coming in for the Treasury to pay all its obligations to bondholders (both principal and interest), all Social Security checks, and all active-duty military personnel. As for small business owners, that will depend on how the President prioritizes payments. Food inspectors, air traffic controllers, specialist who track down loose nuclear materials wouldn’t get their paychecks. Response: As a technical matter, true. Many, if not all, of these federal employees would see their paychecks temporarily delayed. But there is very little likelihood of danger to the public health and safety. During the protracted government shutdowns of 1995-96, which lasted for months, such personnel were designated “essential” and required to continue performing their public duties, on the promise that they would be paid once the dispute was resolved. And they were. To raise the prospect of food being poisoned and airplanes crashing is simply irresponsible scaremongering. Investors around the world will ask if the United States of America is in fact a safe bet. Response: That’s true. But to be fair, global investors already ask whether the US is a safe bet, because we so obviously haven’t gotten our spending and borrowing under control. The three major international credit rating agencies have already downgraded our government debt once (in 2011, after the last round of the debt ceiling debate, when it became clear that Washington was not yet serious about livining within its means). All three agencies have warned that they will downgrade us again, should Congress fail to get serious this year. Markets could go haywire, interest rates would spike for anybody who borrows money. Every homeowner with a mortgage, every student with a college loan, every small business owner who wants to grow and hire. It would be a self-inflicted wound on the economy. It would slow down our growth, might tip us into recession. And ironically it would probably increase our deficit. Response: It’s important to note what Mr. Obama is not saying here. He is not saying that the US Government will “default” on its obligations to creditors. Rather, he is suggesting that the failure to raise the debt ceiling, which will cause a government cash-flow crisis, will lead to economic uncertainty, higher interest rates (because of another credit downgrade), and possibly a recession. Realistically, this is only true if the cash-flow crisis is prolonged. Wall Street can probably weather a brief dip over the “debt cliff,” because of the President’s ability to prioritize (i.e., delay some) payments. Title IX of the Congressional Budget and Impoundment Control Act of 1974 grants the President the power to defer any appropriated spending to a later point in the fiscal year, so long as the White House notifies Congress of the action. Now, some legal experts take the curious view that because the President lacks explicit guidance from Congress on how to prioritize payments, therefore he could just throw up his hands and stop all payments in the event of a cash-flow crunch. The President still has a legal obligation to make various payments, and if funds are available, it would make sense for him to priorize according to his best judgment. Realistically, the President will have no choice but to prioritize. No one could blame him for not spending money that simply is not in the treasury. What they could blame him for is failing to spend any money because he lacks the total amount needed at a given moment. Indeed, I would argue that prioritization is logically implicit in his power as chief executive and his duty to see that all federal laws are “faithfully” executed. In any case, Congress can easily provide the President with guidance, and should. A good place to start would be Senator Pat Toomey of Pennsylvania’s bill, which would direct the President to give first priority to bondholders, Social Security retirees, and active-duty military personnel. Response: Mr. Obama is misleading the public by suggesting the question is whether to pay our bills. Of course we will pay our bills. No one is saying we shouldn’t. The question is whether to raise the debt ceiling without also putting in place reforms to make future borrowing less necessary. Mr. Obama’s resistance to such reforms makes him, not fiscal conservatives, the one holding the absurd position. Response: As we’ve noted, the full faith and credit of the United States is not at risk in this debate. We will not default on our bond debt, period. Nor is there any risk of “crashing the American economy.” Based on the historical experience of the months-long government shutdowns of 1995-1996, which are quite analogous to what would happen if we hit the debt ceiling next month, the American economy will weather the “crisis” just fine. Response: Mr. Obama should look in the mirror to see who is responsible for our 2011 downgrade. It was produced by the Democrats’ refusal to cut spending, not by the Republicans’ insistence on doing so. The credit rating agencies want the US Government to stabilize its debt-to-GDP ratio, and that goal is simply unachievable via tax hikes alone — unless you don’t mind “crashing the American economy” in the process. Spending is the problem, spending cuts are the solution, and Democrats’ refusal to cut spending — or even to pass a budget! — are at the heart of our government’s credit troubles. As for his claims that the 2011 debt debate caused “lower job growth” and “added to the deficit” — these claims are dubious, unprovable, and highly suspect coming from someone who is trying to scare Congress into giving him a “clean” bump-up in Uncle Sam’s credit line. Now, step by step, we’ve made progress towards [my] goal [of reducing the deficit by $4 trillion over ten years]. Response: Washington is running historically high deficits. Neither political party has proposed a credible plan to bring the budget into balance in our lifetimes. (Even the “draconian” Ryan budget would not actually balance the budget before roughly the year 2040, even if all goes well.) In the years before Mr. Obama came to office, annual deficits were averaging below $200,000,000,000 ($200 billion) a year. Since he came to office, we have run four straight deficits in excess of $1,000,000,000,000 ($1 trillion). Mr. Obama doesn’t mention that it would take more than twice his target amount of savings (i.e., more than $8,000,000,000,000 [$8 trillion]) to bring the budget into balance within ten years, nor that he wants to raise all $4,000,000,000,000 ($4 trillion) of his target through higher taxes. His proposed budget would actually increase overall spending. And yet that budget has garnered precisely zero votes in Congress in each of the past two years. Over the past two years, I’ve signed into law about $1.4 trillion in spending cuts. Response: False. What he has signed into law was a promise, made in 2011, to reduce ten-year spending by $1.2 trillion, with the specifics to be determined subsequently by a congressional “super committee” and, failing that, enforced by an automatic “sequester.” The bipartisan super committee could not agree on a single spending cut or reform, and went out of business ignominiously in November 2011. The sequester, scheduled for January 1, 2013, has recently been postponed to March 1st. As for the remaining $200 billion assumed in Mr. Obama’s “$1.4 trillion” figure, it either refers to assumed interest payment reductions, which have not yet materialized (due to lack of spending cuts), or else it refers to “savings” in annually appropriated spending compared to some imaginary, upward-curving baseline — that is to say, they’re basically made up. Therefore, it’s truer to say that, to date, Mr. Obama has not signed one penny of spending cuts into law. Two weeks ago, I signed into law more than $600 billion in new revenue by making sure the wealthiest Americans begin to pay their fair share. Response: True. He did force tax rates up on Americans who earn more than $200,000 a year. He also signed into law — but carefully fails to mention — a substantal payroll tax hike on all working Americans, which will produce more than $1,000,000,000,000 ($1 trillion) in ten-year revenue. When it comes to signing tax hikes into law, the President has a solid record of accomplishment. When you add the money that we’ll save in interest payments on the debt, altogether that adds up to a total of about $2.5 trillion in deficit reduction over the past two years. Response: All of the deficit reduction that has actually occurred over the past two years has been from significant tax hikes. None of it has been from spending reductions. And there will be more deficit reduction when Congress decides what to do about the $1.2 trillion in automatic spending cuts that have been pushed off until next month. Response: This is double-counting. Mr. Obama is trying to simultaneously take credit for $1.2 trillion in savings (as part of the $1.4 trillion he claims to have “signed into law”) and also have us believe that another $1.2 trillion in savings are soon to be realized. It’s the same $1.2 trillion. The fact is, though, we can’t finish the job of deficit reduction through spending cuts alone. Response: Apparently, he forgets that, so far, all the deficit reduction has been through tax hikes. Maybe we should try spending reductions? The cuts we’ve already made to priorities other than Medicare, Medicaid, Social Security and defense mean that we spend on everything from education to public safety less as a share of our economy than it has — than has been true for a generation. And that’s not a recipe for growth. Response: Taken to its logical conclusion, this statement means that the more the government spends, the more economic growth we will have. And conversely, the less the government spends, the less growth we will have. All experience and all logic show the reverse to be true: reducing government spending leads to higher growth. The government produces nothing of its own. It can’t create a single job. Government merely takes resources from the productive sector of the economy and channels them into other, less-efficient uses. How can anyone take this man’s claims about the debt ceiling seriously? Common sense dictates that Uncle Sam must live within his means. The goal should be to balance the budget and stop accumulating debt. So Congress should include real spending reductions in the next debt limit increase. Failing that, Congress should at least pass a plan showing how it will get to balance in the future. The House and Senate are legally required to pass a budget each year. The House regularly fulfills this basic duty. But the Senate has not passed a budget for nearly four years running. Until the American people see a plan for achieving a balanced budget, there should be no debt ceiling increase. We should tell Washington: No budget plan, no debt hike. No more debt until you do your jobs. My own view is that, very soon, the House should pass a debt ceiling increase that takes effect only upon passage by the Senate of a budget resolution that leads to balance. If Senator Reid and his fellow Democrats need a very short-term debt hike to give themselves extra time to do their jobs — fine. But it should be very brief. We must make them do their jobs.